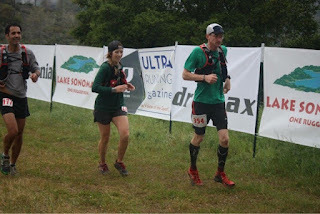 After an eight week stretch of running roughly 60 miles per week including five 50k or longer runs, a 39 mile week followed by only 10 total miles during the week leading up to the 2016 Lake Sonoma 50 had me feeling anxious and even a little slothful. Such is the madness of the taper. I ran this race last year on a considerably lower training base (I averaged ~20 miles per week less during the 4 months leading up to last year's race) and figured I would be able to run significantly faster this year, with the same effort. To find out if that would indeed be the case, I gathered up some things, brought myself to Healdsburg where I grabbed my race bib, enjoyed a nice pre-race dinner, went to sleep and then to the start. Oh, I also bought a shirt at HRC because I forgot mine. Rain was featured on the race-day menu. It fell for the majority of the day, mostly in a gentle and soothing way. I will spare you the details of every single one of the fifty miles I ran and instead just mention that this course is beautiful, like really really good looking. The trails navigate through several zones. Miles of old growth oak groves, then redwoods, steep open grassy hillsides, and pristine views of Lake Sonoma around every corner. As needs to be done in something like a 50 mile race, I ran and ran and ran. I hiked up hills and ran down them. At mile 23-24 during a ~2 mile, 1,000+ ft. climb, I started hitting a low spot. The feelings were familiar and I quickly credited the lull to a lack of and need for calories. I was hoping to hold out until the mile 25 turnaround where I could access my drop bag and chug some Vitargo (something I've been experimenting with for Western States). I decided the risk of having a full-blown bonk were too high so I chomped up a gel. I started to feel better quickly. I arrived at the 25 mile aid station, drank my Vitargo, ate maybe half a cantaloupe, hugged Chris Jones, and started the LONG journey back to the finish. The Lake Sonoma 50 course is described as "relentless" because of the constant climbs and descents provided by the course. Relentless sums it up nicely. I joked with myself to help stave off the reality of just how far away the finish was. "Hah, if I hurry, I only have to run for 5 more hours!". I cruised from aid station to aid station. Up and up, down and down, through mud bogs and streams. At mile 45, I caught up to my friend Katie. We teamed up and pulled each other through the last 5, mostly uphill miles until finally, after 11 hours 43 minutes and 46 seconds, we high-fived Tropical John Medinger at the finish line. It was a great day. I didn't feel too beat up and ran the course in 37 minutes faster than I did last year. I was happy to find that my buddy Jerry (who I ran with for a while in the first half, but beat me by almost an hour!) had brought my truck close to the finish. I hopped in there, grabbed my post-run protein shake, then started chowing down on vegan tamales. Until next time, Lake Sonoma! Lake Sonoma 50 Mile course and elevation profile.